You are browsing the archive for data visualisation. A few months back Open Economics launched a project to list the European banks which have failed recently. After a successful online data sprint and follow up research, we have now collected data on 122 bank failures and bailouts since 1997. To visualize the data collected on bank failures I created this timeline. The data collection was initiated as neither the EU Commission, Eurostat nor EBA were able to provide any specific data. We decided to include a broad range of bank crisis measures beyond bankruptcy filing such as bank nationalisations and government bailouts. 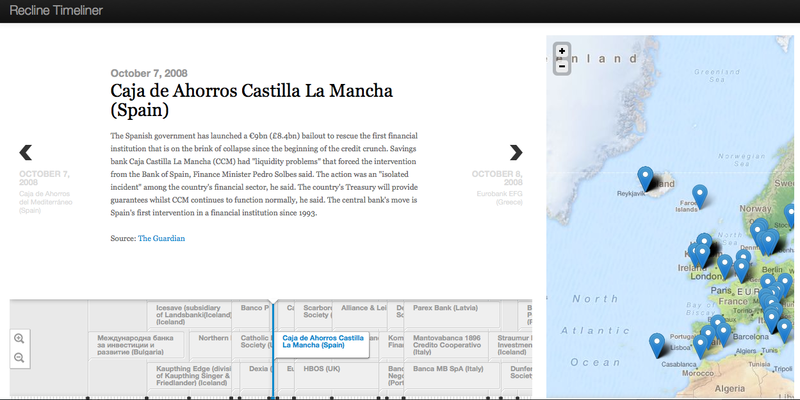 We also added some bank mergers,and finally we have added several cases where banks entered temporary closure (ie. “extraordinary administration” under Italian law). For each failed bank we have attempted to gather basic details such as the date of collapse, a news source and a news clip explaining the circumstances of the collapse. We need your help to improve the failed bank tracker? Here’s how you can help. Bank failures are still missing from the list. So if you know of any failures missing from the list, please go ahead and add the information directly in the sheet. If you have corrections to any of the bank appearing, please add them with an attached source and information. If news clips are not available in English, add information in the original language. Descriptions and sources for several of the banks on the list are still missing – in particular on Italian and Portuguese. Additional info. We hope to add more data to each bank failure, in particular a) The total assets prior to collapse and b) The auditor who signed off on the latest annual report. Let us know if you wish to help digging up any of this information. We are eager to hear your view on the approach or any of the listed bank failures. Join the discussion on our mailing-list.